On Wednesday, November 14th at noon Dr. Matt Helmers, Professor Department of Agricultural and Biosystems Engineering and Director of the Iowa Nutrient Research Center, will discussing the innovative Conservation Learning Lab (CLL) project that is key to understanding impacts of in-field conservation practices beyond the research plot scale. The webinar is a remote training opportunity for all stakeholders, including watershed coordinators, who are working on watershed improvement projects and implementation of the Iowa Nutrient Reduction Strategy. The CLL is providing the opportunity to examine how in-field conservation practices impact nutrient loss at the scale at which water and nutrients are delivered to the stream. Through one-on-one meetings with farmers to complete the conservation planning process, the project team has helped these farmers implement cover crops, strip-tillage and CRP on their land. Pre-implementation and preliminary post-implementation water quality data will be shared from ongoing monitoring within the project areas. Inger Lamb, landowner, PhD, and owner of Prairie Landscapes of Iowa, has a passion for prairie! She puts this passion for native prairie into practice with both her business ventures, and on the agricultural land she owns and co-manages in western Iowa. Inger inherited her family’s century farm in Monona County in 2000. She entered into a crop-share agreement with her first cousin, who lives on the land and facilitates the daily farming operations, while together they handle land management decisions. The century farm, which has been in operation since 1894, is located in a flood plain. This means that the land contains heavy soils that aren’t well-suited for methods like no-till, paradoxically mixed with sandy areas. After a couple years, Inger and her cousin made the decision to begin transitioning the acres that were least suited to agricultural production into the Conservation Resource Program (CRP). A few years later they discovered that some of her land was eligible for the Wetland Resources Program (WRP) as well. Eventually 80 acres were converted to a permanent easement through the WRP, with an additional fourteen in CRP. Inger made sure the land taken out of production was put into high quality, diverse prairie. She took advantage of some U.S. Fish & Wildlife cost share dollars available for the permanent easement acres but paid for the remainder of the improved seed mixes out of her own pocket. While Inger admits that farmers are sometimes cautious with new practices and methods, she vehemently disagrees with the idea that farmers are disinterested in conservation. She points out that farming is a business, and every farmer must balance the economic impacts of their decisions with ecological concerns. Establishing conservation practices on the land has to make economic, as well as ecological, sense for farmers to buy in. The local farming community was a bit reticent of the prairie conversions when they first went in. But as the prairie established, wildlife populations soared. With increased populations of marsh hawks, deer, pheasants, owls, and other wildlife, locals have been eager to enjoy those abundances through hunting. Inger and her cousin are now learning to navigate the many requests for access to their CRP and WRP land for hunting activities, as the local community increasingly appreciates the benefits of their prairie habitat! Inger has always had a deep connection with the land, and a love for plants especially. She received her undergraduate degree in botany at San Diego State University, and went on to graduate school. Inger completed her PhD at Ohio State University with a focus on plant physiology, specifically the symbiosis of legumes. After graduation she completed a year-long Post Doctoral position before moving with her husband and young son to St. Louis. Once in St. Louis, Inger took a break from the academic world to focus on her family, and to apply her knowledge and interests in plants in a more hands-on way. She began volunteering with the Missouri Botanical Garden, where they were putting in a native landscaping for the home garden demonstration area. This was her first exposure to the idea of using local, native species for gardening, and it is in this way that she started to familiarize herself with native plants. When her family moved to central Iowa and her son began elementary school, Inger discovered that the school was badly in need of someone to take on the management and upkeep of its outdoor classroom and butterfly garden. Already devoted to volunteer work, Inger took on the role and spent the next six years shaping the native prairie beds into vibrancy, and taking classrooms of elementary students out into the gardens to learn about prairie plants and the wildlife they support. She balanced this volunteer work with her job with Prairie Rivers Natural Resources Conservation Service and Development. Her devotion to the work at her son’s school led Inger to start dreaming of a business model that would allow her to translate her love and knowledge of native prairie into a career. In 2007, Inger started her own business, Prairie Landscapes of Iowa. Her clients include cities, schools and universities, businesses, homeowner associations, and individual landowners who want to utilize native landscaping on their properties. Prairie Landscapes of Iowa is currently managing sixty projects, including one for a private company in Ames that was started by planting nearly 8000 native plants, now in its fourth year of growth. What is Inger’s primary motivation for spreading the word about planting native prairie in Iowa? To answer this question, she pulled an autographed book out of the backseat of her vehicle. “Bringing Nature Home,” by Douglas Tallamy, tells the story of how installing native plants in backyards all over the country can save many of our waning wildlife populations from mass extinction. Inger wholeheartedly agrees with this approach to sustaining biodiversity through re-building native habitat, and she routinely gives copies of the book out to her clients. 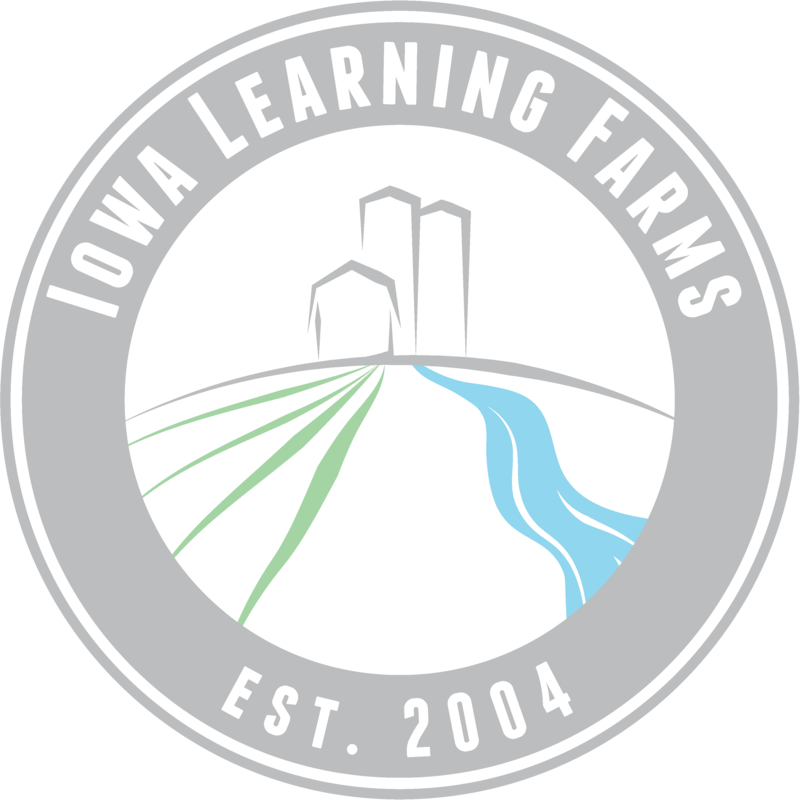 Iowa Learning Farms is grateful for Inger’s mission to bring native prairie back to Iowa’s landscape in both rural and urban landscapes. From her work to convert portions of her own farmland to CRP and WRP, to sustaining a thriving business that helps others learn how to support native plants on their land, Inger is bringing back a piece of the prairie in Iowa; supporting the survival and biodiversity of our state’s migrating bird and insect species along the way! In partnership with Rapid Creek Watershed Project, we are hosting a filter strips and soil health workshop on Thursday, April 13, from 5:30-7:30 p.m. at the Morse Community Club near Iowa City. We hope to see you there! Tim Youngquist, discussing the Science-based Trials of Rowcrops Integrated with Prairie Strips (STRIPS) project where a small percentage of a field is planted into strips of perennial prairie plants to reduce soil erosion, water runoff, improve soil health and to create habitat for pollinators and wildlife. Matt Berg, Johnson County Farm Service Agency Director, to lead a discussion on the Conservation Reserve Program (CRP). Adam Janke, Iowa State University Extension Wildlife Specialist and newest ILF team member, will talk about ways to incorporate wildlife habitat on the farm. Wren Almitra, Rapid Creek Watershed Coordinator, with a project update. Attendees are encouraged to bring their own soil samples for a free SOILSCAN 360 analysis by Johnson County NRCS staff during the event. The field day will be held at the Morse Community Club located at 2542 Putnam St NE, Iowa City, IA. The workshop is free and open to the public, but reservations are suggested to ensure adequate space and food. Contact Liz Juchems at 515-294-5429 or ilf@iastate.edu. Note: Today’s guest blog was written by Michelle Soupir, Leigh Ann Long, Katherine van der Woude. They are conducting a monitoring and research project in Black Hawk Lake watershed in Sac County. Michelle presented at our Iowa Learning Farms field day on September 15th in Lake View. It was a great chance to share with area folks what they have been learning about water quality in the small streams feeding Black Hawk Lake and we wanted to share it with you too! We have been collecting water samples from three subwatersheds in the Black Hawk Lake watershed since March 2015, and the data we have clearly shows the positive impact that conservation practices have on water quality. Katherine van der Woude collects samples from their automated samplers and meets a new amphibian friend near Black Hawk Lake. One part of our work is comparing two subwatersheds with similar soils and of similar size, about 450 acres each. Subwatershed 12 has various conservation practices implemented over nearly all of its area including: cover crops, terraces, nutrient management plans and CRP on both sides of the stream near where we collect our samples. The second location, subwatershed 11 has only about 25% of the subwatershed in conservation practices. See map below. 2015 was a wet year with nearly 35 inches of rainfall in the watershed, compared to a long term average of 20 inches. Much of the extra rainfall came as highly intense storms, which has an impact on soil erosion and nutrient movement. From the site with fewer practices (11), average nitrate loading in 2015 was 153 lbs/ac, while the site with lots of conservation practices (12) had an average load of 115 lbs/ac. This calculated to about a 33% increase in nitrate load from the site without conservation practices. Total phosphorus loads were also higher from the site without conservation practices (11) at approximately 2.7 lbs P/ac., with 92% of the losses occurring during storm events. Two-thirds of those total P losses came from a single storm event in June 2015 that delivered 4.1” rainfall in 2 ½ days. In the subwatershed 12, the average total P loads were nearly half of those from the site with fewer practices. And finally, enormous differences were observed between the total suspended solids; 2,900 lbs of soil per acre were lost from subwatershed 11, but less than 89 lbs/ac were lost from the site with many conservation practices. Again, most of the soil losses came from storm events. These results show what a tremendous difference conservation practices can make and how important it is to use many different approaches to meet water quality goals. For more information on the Black Hawk Lake Watershed Water Quality Project follow them on Facebook and Twitter. Questions about the monitoring project can be directed to Michelle Soupir at msoupir@iastate.edu.